SAN JOSE, Calif.--(BUSINESS WIRE)--Feb. 21, 2019-- Cypress Semiconductor Corp. (NASDAQ: CY), the embedded solutions leader, today introduced a USB-C Power Delivery (PD) solution designed to reduce the e-waste resulting from the estimated one million tons of power adapters produced per year1. The Cypress EZ-PD™ Barrel Connector Replacement (BCR) solution has the potential to replace the myriad of barrel connectors used in power adapters that consumers are currently burdened by. It can also replace all legacy USB micro-B connectors that provide only 7.5 Watts, which is not nearly enough to power most consumer electronic devices or industrial applications. USB-C connectors with USB PD provide up to 100W and are widely being adopted in automobiles, smartphones, laptops and peripherals, and tablets. This combination makes USB-C connectors ideal to serve as a universal power adapter standard that eliminates the need for manufacturers to produce customized chargers—enabling the convenience of reusing chargers for electronic devices such as IoT devices, smart speakers, power tools, electric shavers, drones and other rechargeable devices. Cypress’ EZ-PD BCR controller offers a high level of integration in a small footprint package that minimizes bill-of-material cost and simplifies designs, enabling developers to quickly convert their products to be powered via a USB-C connector with few external components and no firmware required. Cypress accelerates the transition to USB-C connectors with the new EZ-PD BCR Kit, which enables product developers to quickly prototype without requiring firmware development. More information on the solution is available at www.cypress.com/bcr. And three, embed the EZ-PD BCR controller into the product, replacing the barrel receptacle with a USB-C receptacle. The product can then be powered by any USB-C power adapter supporting the desired USB Power Delivery profile, giving the manufacturer the option to allow consumers to use their own USB-C power adapters instead of providing one in-box. Cypress will demonstrate the EZ-PD BCR solution at Embedded World 2019 in Nuremberg, Germany in its stand (#148 in hall 4A) of the Nuremberg Exhibition Center from February 26-28. 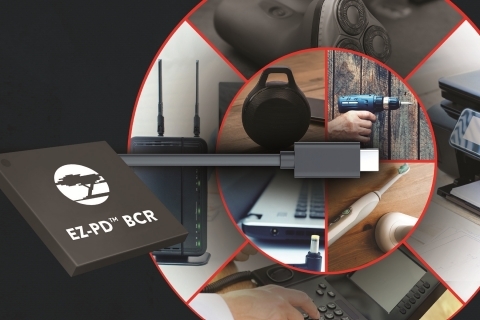 Cypress’ EZ-PD BCR solution complies with the latest USB Type-C and USB PD 3.0 standards. The BCR controller integrates a complete Type-C USB-PD transceiver, a load switch controller with a soft start, all termination resistors required for a USB-C port and system-level ESD protection. The one-chip solution minimizes bill-of-material costs for USB-C power adapters by integrating error amplifiers for constant voltage, constant current and PPS applications, a 30 V regulator that allows direct operation from VBUS, VBUS short protection on configuration channel (CC) pins, gate drivers for high-voltage power FETs, a low side current sense amplifier, and dedicated hardware for legacy charger detection protocols plus system level electrostatic discharge (ESD) protection. Overvoltage and overcurrent circuitry protects systems against power overloads and other faulty operating conditions. The CYPD3177 EZ-PD BCR controller is now in production in a 24-pin QFN (16 mm2) package. Designers can get started with the EZ-PD BCR Kit (CY4533), which is now available for $25. More info on Cypress’ USB-C and PD solutions is available at www.cypress.com/Type-C.
Cypress’ EZ-PD portfolio of USB-C controllers also includes CCG1, the world’s first programmable USB-C controller, CCG2, the market’s smallest programmable USB-C solution, CCG3, the market’s most integrated programmable USB-C solution, CCG4, the world’s first two-port USB-C solution, and CCG5 and CCG6, the market’s first two-port USB-C solutions optimized for Thunderbolt notebook and desktop PCs. The EZ-PD portfolio was the first to support the latest USB PD 3.0 specification, which enables more robust end-to-end power delivery and charging solutions for laptop and mobile devices. The portfolio also includes versions of CCG2 and CCG3PA that are AEC-Q100 certified for automotive-grade performance, enabling fast charging of portable electronics in vehicles. Cypress and the Cypress logo are registered trademarks and EZ-PD is a trademark of Cypress Semiconductor Corp. All other trademarks are property of their owners.